Sadly, my time in Greece is coming to an end. Cue a raging fit of tears and a very pouty face. Yes I’m retreating to toddler-like behavior, I can’t help it. For the most part the food has been great, although Santorini is MILES better than what we had in Mykonos. I don’t know if we were just picking the wrong places, or if the food just isn’t that great in Mykonos, but either way I’m LOVING the food here in Santorini. Some of my favorite meals have included, Moussaka, Gyro’s with fries, shrimp soulvakia, the MOST delicious cut of beef I’ve ever had, a to-die-for salmon filet and many many other dishes. I’ll do a recap in the next couple of weeks with pictures – hope you’re excited! These watermelon stacked salads are another Grecian dish of what I previously pictured we’d find here in Greece, although I’ve come to find that the majority of dishes are much, much more down home than this is. The one thing that is constant are the huge, and I mean huge portions of feta. Every salad I’ve had comes with at least two slabs of feta cheese perched atop the freshest tomatoes, cucumbers and green peppers. (Green peppers, weird right??). 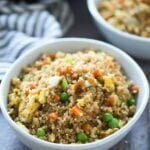 Regardless of how authentic these stacked salads are, they are seriously delicious and perfect for summer dinners! I’m out for the week, but I’m SO inspired to get back to blogging next week! Have a great Memorial Day weekend my friends!! Prepare a grill or grill pan to a very high heat. Place balsamic in a small saucepan. Turn the heat on medium, bring to a boil and reduce to a simmer until thickened and similar in texture to syrup, about five minutes. Let cool. 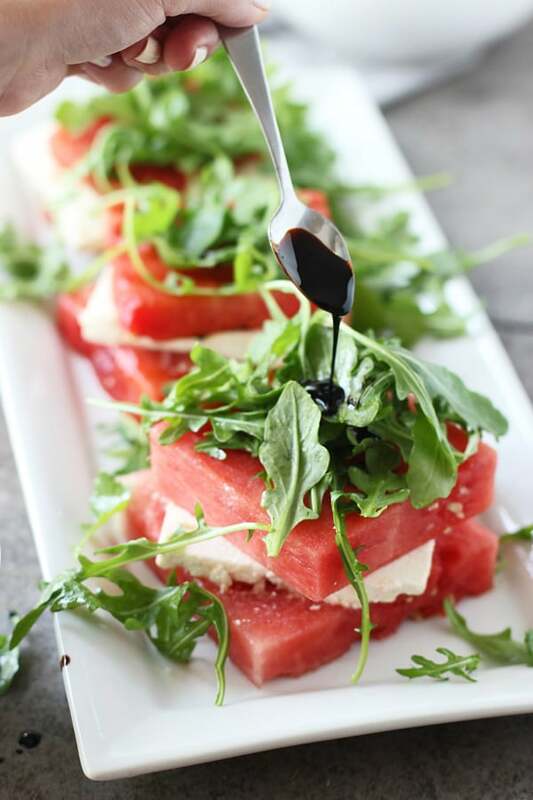 Drizzle watermelon with a little bit of olive oil, season with a bit of salt and pepper. Grill VERY quickly, just getting a slight char, about ten seconds per side. Toss arugula with about a teaspoon or two of olive oil. Season with salt and pepper. 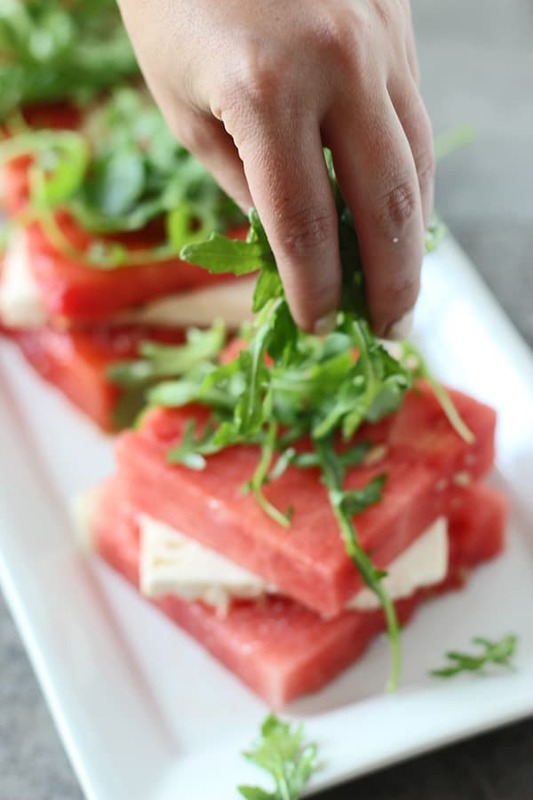 Place watermelon squares on platter, top with feta, and another watermelon. 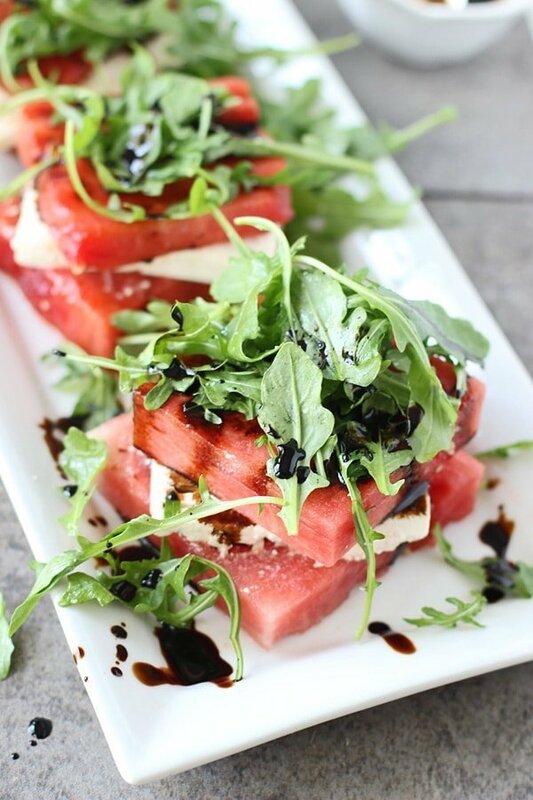 Place about ½ cup of arugula on top of watermelon and drizzle with reduced balsamic vinegar. 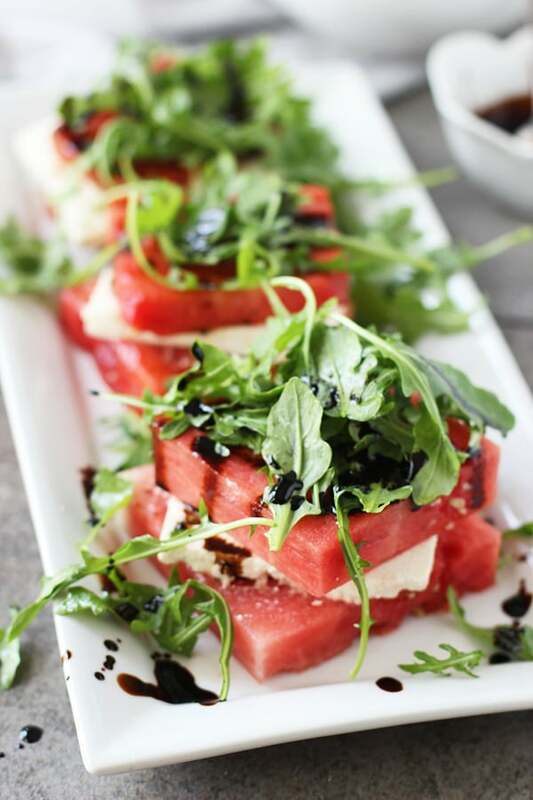 33 Responses to "Grilled Watermelon and Feta Stacked Salads"
Judging from IG it looks like you are having an AWESOME time friend – I’m sorry it’s coming to an end! But, I am IN LOVE with these stacked salads! So perfect for Summer! Pinned! Ohhhhhhh I definitely gained quite a bit of weight, I just kept eating and eating and eating…Still haven’t stopped now that I’m back. Ha!! Thanks Isadora!! 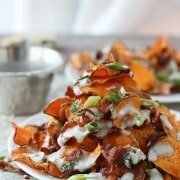 These look wonderful!!! So pretty!! Can’t wait to see you and hear about everything!!! gah! I can’t even wait to see your pictures from Greece..it looks absolutely beautiful! So glad you had such a great time! 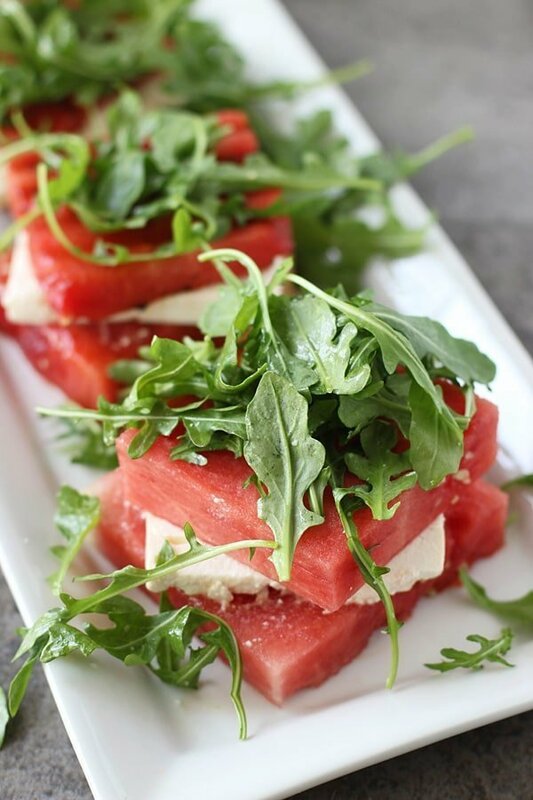 I have a serious obsession with feta and watermelon, this is totally something I could dig in to! Love the simplicity of it, but yet so elegant. Gorgeous! Thanks Alaina, it was SUCH a wonderful time!!!! That’s totally what I thought too, in my head it seemed so simple, but once I put it together, I was like WHOAH, this is so pretty and fancy looking! Ha! I’ve probably posted this here before (so sorry if I am repeating myself for the fifth time or something!) but I lived in Greece for over a decade and I’d say that like anywhere you have to know where to go for the best food in Greece. A good rule of thumb is to stay away from places only packed with tourists and go where the Greeks go. You can find some amazingly tasty ‘rustic’ food in Greece, but there’s also a new trend of modern Greek food where you’d probably find dishes more like this wonderful melon salad. So glad you enjoyed Santorini … stunning, isn’t it?! P.S. You don’t get green peppers where you are??! Here in Europe they’re the cheapest variety. Ohmygosh, you’ve never told me that before!!! I can’t believe you lived there! What a dream. We tried to stay away from touristy places, but I think we hit some of them in Mykonos unfortunately. The food was still good, just not amazing like I was expecting. Santorini was AMAZING!!! I loved every second of it — the food, the scenery, the people — everything! We do get green peppers here, actually I use them all the time, but in the US you never see them in Greek salads, so that surprised me! 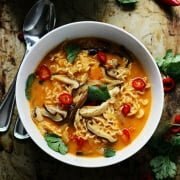 This looks amazing- I love the combination of flavours- so good! Well it looks like you had an awesome time from instagram!! haha That sounds slightly stalker-ish : ) But I understand the feeling of wanting to come back to your own bed (and of course pup! I miss her a ton when we are away!). 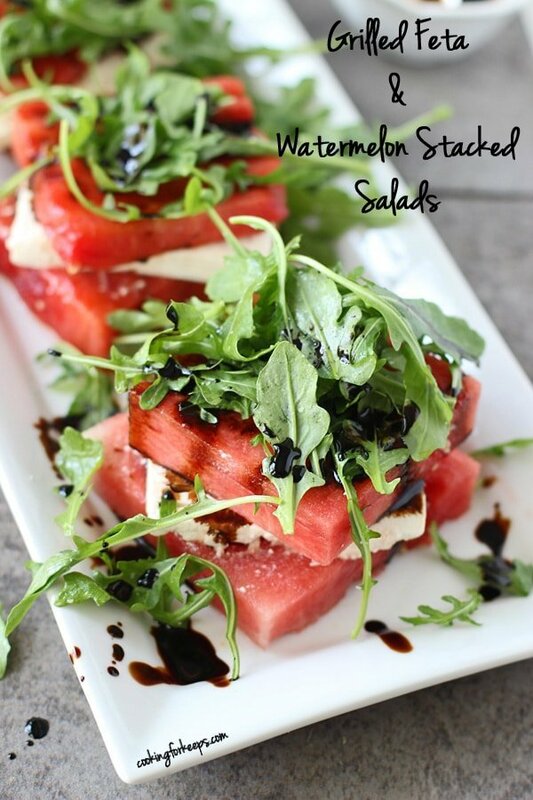 These stacks look awesome – I love the combo of watermelon and feta! I did!!!!! I felt like I was overloading on Instagram, but there were just too many great pics to keep them all to myself!!! Sleeping in my bed after over 24 hours of travel was the best!!!! 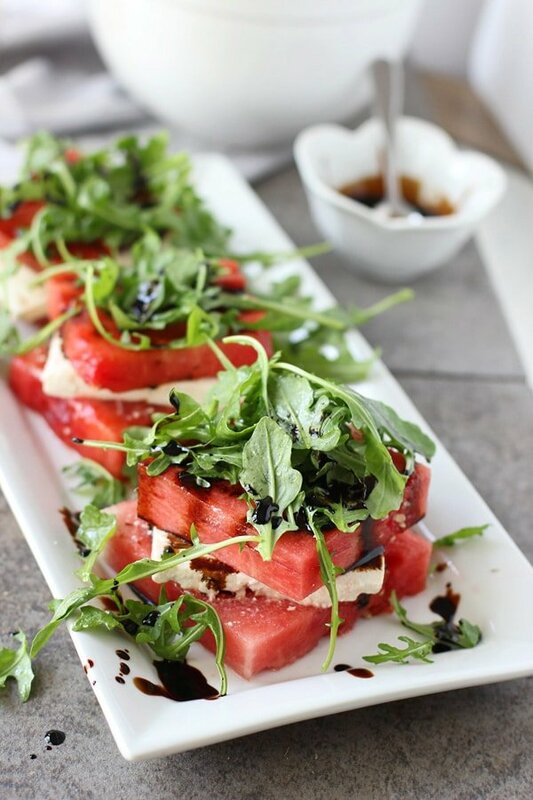 I love anything watermelon and I can imagine it’s amazing in this dish! Honestly, I’m surprised you blogged at all while you were in Greece. But I’m so excited for your recap!! If we still lived on the east coast, there is no doubt that would have been our honeymoon spot. Santorini looks absolutely divine! Glad you had a great time in Greece! I’ve always wanted to go there. This salad looks wonderful. 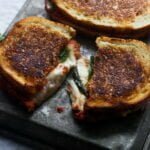 Love lots of feta! And what a delicious recipe this is hun. 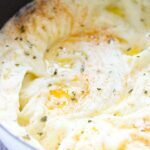 Thank you, it’s such an easy salad which can easily be whipped up for a meal if friend’s suddenly drop in. I usually have the ‘few’ ingredients handy all Summer. 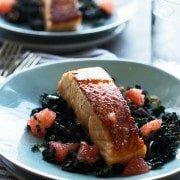 Your friends are sure to love this beautiful fetta, tomato & watermelon salad too, as it’s such a tasty & refreshing salad, one which can be enjoyed on its own or as an accompaniment to any meat or seafood dishes. I’m so glad you introduced me to this delicious salad – I’m sure it’s my favorite salad atm ?